DC COMICS CHARACTER AQUAMAN RETURNS WITH HIS WIFE MERA; TOM WELLING DIRECTS AND MICHAL HOGAN ("BATTLESTAR GALACTICA") GUEST STARS AS COL SLADE. - In an effort to protect the rest of the team, Oliver (Justin Hartley) decides to register for the Vigilante Registration Act to see what the government plans to do with the new law. As he suspected, it was a trap to lure superheroes to an undisclosed location where he is confined to a jail and subjected to a battery of brutal tests under the supervision of Col. Slade (guest star Michael Hogan, "Battlestar Galactica"). Aquaman (guest star Alan Ritchson) and his new wife Mera (guest star Elena Satine) team up with Clark to free Oliver. Lois is frustrated when Clark continues to push aside her offers to help the team and sets out to prove she can play with the big boys. Tom Welling directed the episode written by John Chisolm (#3X6009). Dissappointing!! I was expecting big things for this episode, with Aquaman and his missus back but it seemed lacking in something, maybe not enough action, with aquaman they have the opportunity to do some big action scenes, but there was none, a small one at the beginnning with the oil rig exploding....and the rescue of Oliver was very easy....too easy!!! 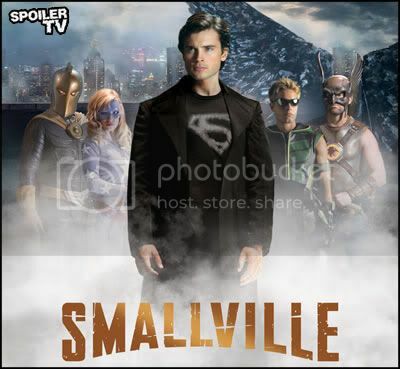 please smallville, dont give us half a good season and let us down in the end!!! !